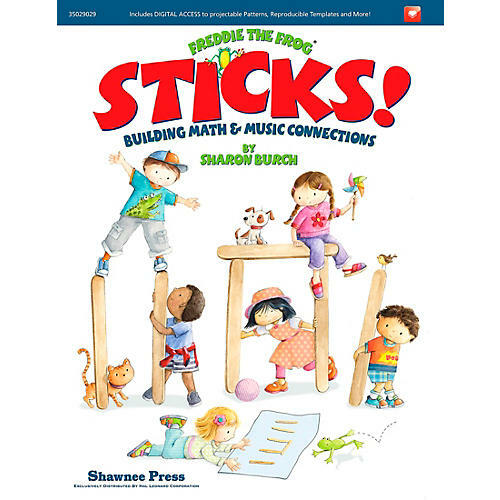 This exciting new resource by Sharon Burch, creator of Freddie the Frog, is a step-by-step guide to read, analyze, compose, write and assess with craft sticks all while incorporating the National Common CORE Mathematics Standards in the process! The sixteen singing games, craft stick lessons, and "solve the mystery" interactive charts included on the enclosed CD-ROM make teaching music and math easy and fun. Each step leads to something fun for the kids to sing, write, or play, all keeping the students engaged to the last second of class. Who knew there was so much fun AFTER dessert? Grades K-2. Songs include: Apple Tree; Bell Horses; Hill, Hill; Lemonade; No Robbers Out Today; Pumpkin Fat; The Mill; We Are Playing in the Forest; Engine, Engine; Hot Cross Buns; Lucy Locket; Pease Porridge Hot; Snail, Snail; Choo Choo Train.